There are 8 outputs and each sequence consists of up to 8 steps per output. It has 8 pattern memories (sets of 8X8 sequences), which can be played back in any order and chained into a series of patterns up to 100 patterns long. There are even two CV input jacks to control the sequences, patterns, or tempo. All of this fits in a very compact 8 HP wide module. 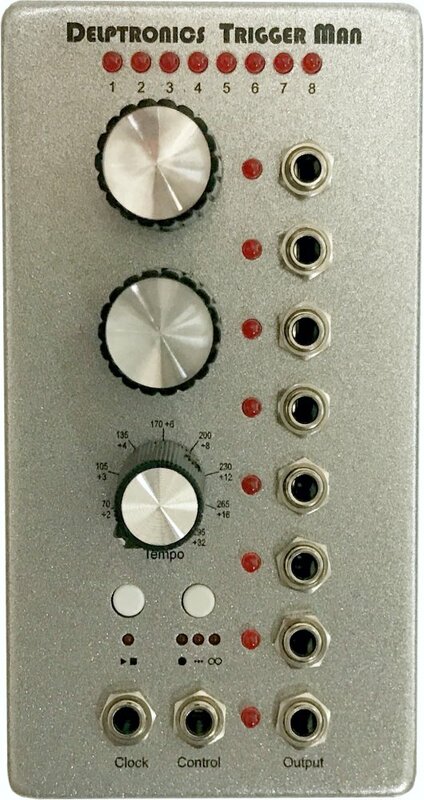 The Trigger Man is a great companion to the Delptronics LDB-2e Analog Drums Eurorack Module. The Trigger Man is now even more powerful with the Version 2 firmware update! We added tons of great new features in the same hardware. There are so many new features, the user manual is twice as long. And yet, we kept the basic functionality the same. So you can explore the more advanced features at your leisure. If you already own a Trigger Man, find out how to get the update. 1. Send your module to us. There is no charge for the upgrade. You pay only shipping costs. Package your module securely so that it is safe for the trip. Your packing materials will also be used to ship the module back to you. Include your return address on a piece of paper inside the box. Sometimes return addresses on the outside of the box get obscured during shipping. Also, please include your email address in case we need to contact you. It's easy. These instructions explain how to do it. If you already own a PIC microcontroller programmer, and you know how to use it, then just download the HEX file, and update your module. If you do not have a PIC programmer, you can purchase one fairly cheaply. Details are on the next page. Note that if you live outside the United States, it will be cheaper and faster to buy a PIC programmer and do the update yourself, rather than to pay and wait for international shipping. How do I know which version firmware I have? If you purchased your module before December 1st 2014, then you have V1. To verify, you can go into Action Mode (press and hold the Mode button), and turn knob 1. You have V1 if the step LEDs change from 1 to 4 to 8 illuminated LEDs in 3 clicks. You have V2 If the step LEDs change from 1 to 2 to 3 to 4, etc to 8 illuminated LEDs in 8 clicks. Dark Corridors - Modular Patch from Richard Devine on Vimeo.